TEM Sample Preparation (FIB-lamellas). Atomprobe Sample Preparation. EDS/EBSD Analysis (2D and 3D). Computerized Field Emmission (FE) – Scanning Electron Microscope (SEM) with Patented GEMINI electromagnetic/electrostatic objective lens system. Detectors: Chamber Detectors (Everhart-Thornley SE detector/ Combined Secondary Electron Secondary Ion – SESI – detector), EsB (detection of energy and angle selective backscattered electrons), In-lens Detector (mounted in GEMINI column), 4QBSE-detector (pneumatic retractable 4 Quadrantsolid state BSE-detector), STEM detector (Scanning Transmission Electron Microscope detector). Cobra Focused Ion Beam (FIB) Column with gallium source (service life: 1500µAh). Single GIS (Gas Injection System): Pt (Platinum). EDS-EBSD-System EDAX PEGASUS TEAM with Hikari-EBSD-Camera and Octane Super EDS-Detector (60mm²), 2D and 3D. Target-preparation or preparation at materials, where electropolishing does not work: for example Lithium batteries, Fe-Cr alloys, W alloys, Hydrogen containing materials. Studying material structure and corrosion processes on Lithium batteries. 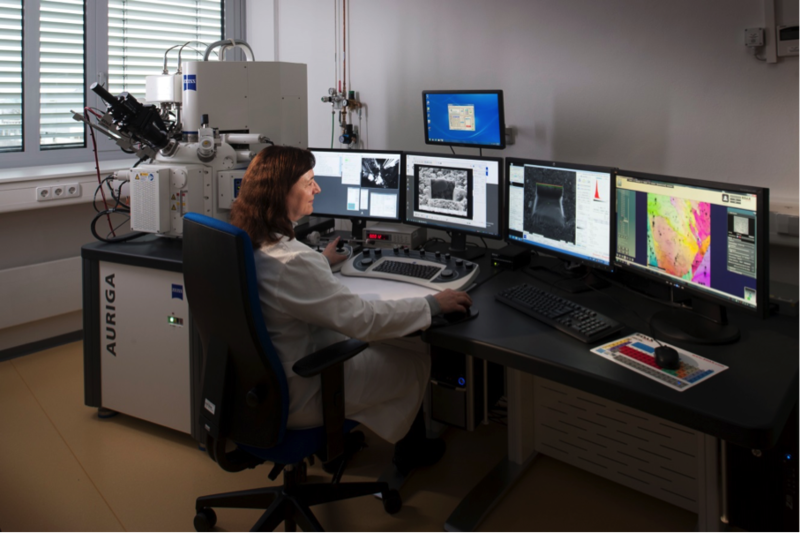 Investigating micro- and nanostructure and grain orientations of alloys. Characterization of precipitate or particle distribution in those materials. Primarily, materials for programs to Renewable energy and its energy storage facilities (e.g. Lithium batteries).